Former Northwestern football player Napoleon Harris is running for the Chicago congressional seat vacated by former House Rep. Jesse Jackson Jr. (D-Chicago). Harris joins more than a dozen other Democrats running in the February primary. Former Northwestern and professional football player Napoleon Harris is entering a crowded field to replace an embattled Chicago congressman. 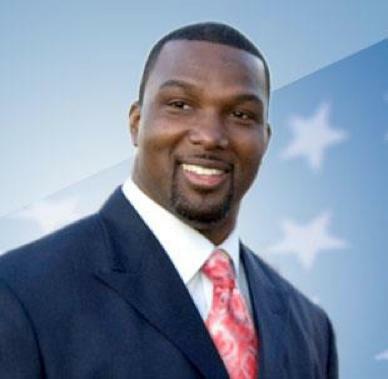 A native of Dixmoor, a small city south of Chicago, Harris returned to his hometown after playing seven seasons in the NFL and was elected as 15th district state senator in the November 2012 general election. When former House Rep. Jesse Jackson Jr. (D-Chicago) resigned from office, opening up the 2nd Congressional District seat, Harris decided to run with the support of his constituents. “Coming back was not a question, I will never forget where I came from,” Harris said. Harris is one of 22 candidates who filed petitions to run for the House seat and will compete for the Democratic primary nomination on April 26. He described his campaign as a grassroots movement and has spent his days answering over 100 phone calls a day and going door to door trying to gather support. Harris attended elementary and middle school in Dixmoor, which has a population of 3,644, according to the 2010 Census. He enrolled in Thornton Township High School in Harvey, a neighboring city, where he excelled as an honors student as well as a basketball and football athlete. His athletic ability in football drew attention from the media including the Chicago Tribune, which named him defensive player of the year. He accepted a scholarship for football from NU because of its reputation as a top academic school, he said. Harris said he would like to bring the same sense of collaboration to public office. More than 6 feet tall and weighing 250 pounds, Harris proved a formidable defensive part of the field, able to “stop the run as well as the rush,” according to his Northwestern football profile. In 2001, he was selected as the top outside linebacker in the 2002 NFL draft. The strict diets and workouts he followed in preparation for sports fostered a disciplined mindset in him, Harris said. “I think athletics makes you competitive at everything, but more important is a set of traits that good athletes always have like discipline,” he said. Harris entered professional football after the Oakland Raiders drafted him in the first round of the 2002 draft. In the 2003 Super Bowl game between the Oakland Raiders and the Tampa Bay Buccaneers, when Harris was asked which college he played for, he replied by giving a shoutout to his hometown. While he played in the NFL, he contributed to the community by opening two Beggars Pizza locations in the area and setting up a reading program at Thornton High School. He created the Napoleon Harris Scholarship fund, which has helped students in the Kansas City and the Chicago area enroll in college.